As an introduction to ancient Lydia, some discussion is far too technical for a general reader. However, the clarity and conciseness of discussion on Lydian history and culture alone (Chapters One and Five) should be sufficient reason to consider purchasing and reading this work. While some discussion of ancient Lydia may be confusing, especially the Lydian language, it is still by far the best introduction to ancient Lydia. 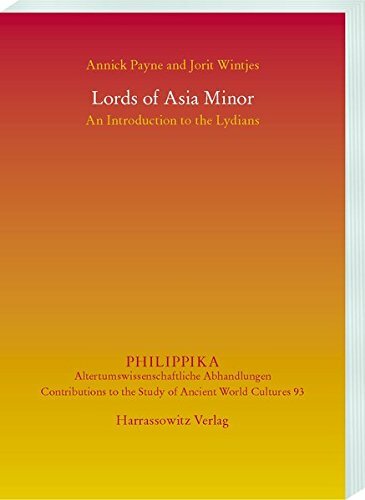 In Lords of Asian Minor, Annick Payne and Jorit Wintjes provide a wonderfully clear and accessible introduction to the Lydians. Through the succinct exploration and presentation of five major aspects of ancient Lydia, the reader is left with a solid, introductory knowledge of Lydia’s history as a minor regional power, then major regional power, and as a forgotten, mythologized people group. More nuanced discussions, namely on archaeology, inscriptions, civilization, and legacy, more fully illustrate the nature of Lydia following a historical overview. Chapter One issues the historical overview, a concise and clear introduction to Lydian history, divided into three sections: sources, geography, and a chronological history. The chronological history is particularly clear and easy to follow. Regarding structure and organization, this chapter is excellent because the source and geography discussions prime genderal readers for more clarity in reading the brief Lydian history. I, not knowing too much historical narrative about the Lydians, gained substantial historical understanding through the authors' presentation of Lydian history. Likewise, a discussion of the sources provides a beneficial framework by ensuring the reader is fully aware of what are the sources being utilized. A major focus of this chapter allows general readers to see firsthand how specialists work to interpret and reconstruct history. Discussion of Herodotus, for instance, demonstrates how and why certain details may or may not be historical and may or may not have a kernel of historical truth. In other words, they do not assume the readers understand exactly how historians use a lens of discernment when approaching ancient texts and, instead, offer insightful, refreshing demonstrations of discernment in reconstructing history. Chapter Two surveys the history of Lydia’s rediscovery from the 14th-21st centuries and the archaeology of Sardis, capital of Lydia, and greater Lyida. In this, it becomes apparent to the reader that a lack of significant archaeology of ancient Lydia is problematic for reconstructing a historical narrative that fits with literary accounts of Lydia. Again, like Chapter One on Lydia’s history, in Chapter Two Payne and Wintjes clearly demonstrate why and how they reach certain conclusions, especially ones which point to Lydian archaeology as insufficient for providing significant elucidation of historical, extant (existing) texts. Chapter Three is, unfortunately, the most complex ‘introductory’ discussion within the book. Although the introductory remarks about the Lydian language may assist general audiences, the description of Lydia is highly technical and depends on functional understanding of linguistic terms. Thus, while some linguists and historians may find value in the chapter on the Lydian language, the high level of technicality makes it unapproachable to general audiences. Chapter Four focuses on the history of scholarship for Lydian inscription decipherment, a very brief review of types of inscriptions, and three samples which “illustrate the genre of dedications and funerary inscriptions… and further… highlight the level of problems still encountered by current attempts to read these ancient inscriptions” (81). One of the most valuable aspects of this chapter is the up-to-date overview of scholarship, for it offers a plethora of alternative scholarship available. Likewise, sample inscriptions with commentaries permit general readers to see exactly how and why texts are difficult to read. Regarding the overall chapter organization, this chapter should have taken place prior to discussion of Lydian language (Chapter Three) because it would have provided readers with some important background knowledge on what we know about the Lydian language as a primer for a more nuanced, linguistic discussion. Chapter Five finally considers three major aspects of Lydian civilization: money, religion, and burial customs. By examining these three aspects, Payne and Wintjes clearly illuminate some culture and customs of Lydia. As in previous discussions, the conciseness and clarity regarding the topics make it highly understandable and accessible. In particular, their discussion of Lydian religion is highly informative to general readers and scholars alike. Chapter Six wraps up by very briefly considering the reception history of Lydia, and elements within Lydia, by highlighting the titles of several major operas, arts, music, and other place in which we see the influence of Lydia, especially Croesus. Above all, the best feature throughout Lords of Asia Minor is the consistency with which the authors explain why and how they reach certain conclusions. Even if they offer an interpretation generally accepted in the larger academic community, they still take the time to explain why it is so. Consequently, the reader is unknowingly introduced to historical criticism. Additionally, the clarity with which Payne and Wintjes write makes the introduction, especially the discussion about the history of Lydia and Lydian civilization, easily digestible, intriguing, and engaging. Although some discussion is far too technical for a general reader, the quality of presentation for the Lydian history and culture alone (Chapters One and Five) should be sufficient reason to consider purchasing and reading this work. Payne, Annick. "Lords of Asia Minor: An Introduction to the Lydians (Philippika)." Ancient History Encyclopedia. Last modified August 29, 2016. https://www.ancient.eu/review/148/. Payne, Annick. "Lords of Asia Minor: An Introduction to the Lydians (Philippika)." Ancient History Encyclopedia. Ancient History Encyclopedia, 29 Aug 2016. Web. 22 Apr 2019.